An amortized loan is one that is paid off in equal periodic instalments or payments and includes varying portions of principal & interest during its term. Examples of amortizable loans include auto loans, mortgages, business loans & others. 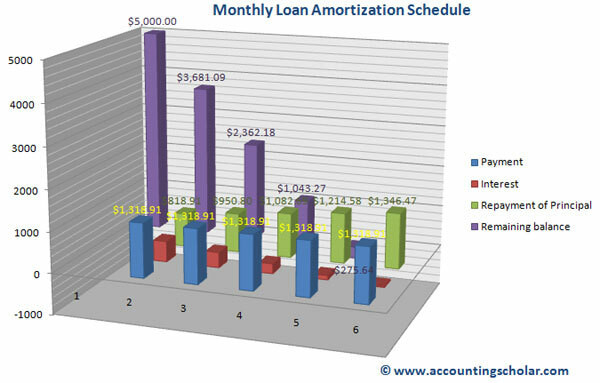 How do you compute the periodic payments on an amortized loan? Consider a firm borrows $5,000 to be repaid in five equal instalments at the end of each of the next five years. The discount rate on this loan payable is 10%. What is the amount of each instalment payment? * Note the interest in Year 1 is calculated by multiplying the ending balance, $5000 by 10% which totals $500. In year 2, interest is calculated by multiplying the ending balance $3,681.09 by 10% which is $368.11. ** Repayment of Principal (D) = (B) – (C) ----We know that the total monthly payment will be $1,318.91, thus the repayment of principal amount is Payment – Interest. Mortgage lenders who work for banks & financing companies use this amortization formulas and methods to determine the periodic mortgage payments & break them down in to principal & interest reductions. This information is also used by consumers who need a breakdown of their monthly payments, and how much of that goes in to interest & how much balance goes towards their principal.